John Cuff (1708-1792) was a maker of spectacles and microscopes in London. His principal patron was Henry Baker (1698-1774), who published several popular books on microscopy, which included engravings of several of Cuff's microscopes. With direction from Baker, John Cuff abandoned the common microscope design of the era and created a modern design that changed the face of microscopy. The advantage of Cuff's instruments was the cruciform stage affording improved accessibility for hand manipulation of the specimen by the microscopist, compared to the then popular, but inconvenient, three-pillared microscopes of Culpeper. Cuff's instruments improved the focusing mechanism, but also included the common Bonanni spring stage and gimbal mirror of the Culpeper design. 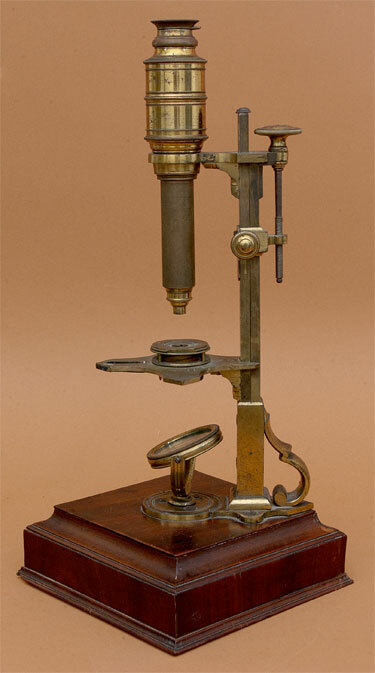 Cuff's improved microscope was extremely popular and his design swept across Europe. With a few years Cuff-Style instruments were being made by competing instrument makers in England, Italy, Holland, and France. Although he was a fine instrument maker, he was a poor business man, and was declared bankrupt in 1750. He continued to make instruments until 1758, when he had to give up his shop in London. This instrument in the Golub Collection is signed on the stage J. Cuff, Londini fecit. It has a single support pillar and a tandum focus pillar controlled by a Helvelius screw fixed at its base with a jam screw. The illumiating mirror is a Culpeper-type with a single reflecting, parabolic face and supported in a gimbal mechanism. 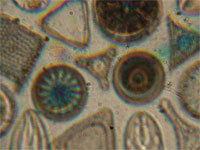 The microscope optics consists of the typical three body sections with a Field lens between the objective and eyelens. The Eye and objective lenses are biconvex. The field lens is plano-convex, with the flat surface facing the objective lens. The eyelens has a sliding dust shade. The assembled microscope body slides into a cantilevered limb and is maintained in place by friction. This microscope has six objectives, labeled "1" - "6", with No. 5 missing and an additional, unmarked high-magnification objective present. Imaging is good, but with a significant amount of chromatic aberration. There are two interesting glass micrometer rulings included with this instrument. They clearly show rulings of 1/60th of an inch. The microscope is screwed into a mahogany case that acts as the stand and storage box. A drawer is inserted into the front of the wooden case. It is lined with green felt and holds the few accessories. Accessories consist of a stage pointer, fish plate, Lieberkuhn reflector case (the reflector is missing), a brass sample holder, stage live-box, and three glass pieces. The assembled instrument is 35cm tall.